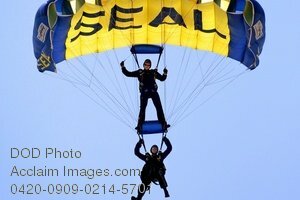 Description: Free, public domain image: Members of the Navy Parachute Team, The Leap Frogs, Doing Tricks. NORFOLK (July 18, 2009) Members of the U.S. Navy Parachute Team, the Leap Frogs, flare their parachutes before landing on the beach during a capabilities demonstration at Naval Amphibious Base Little Creek, Va. The Naval Special Warfare community displayed its capabilities as part of the 40th UDT-SEAL East Coast Reunion celebrations. Events are planned throughout the weekend to honor UDT/SEAL history, heritage, and families. U.S. Navy Photo by Mass Communication Specialist 2nd Class Matt Daniels.